When it comes to accessories, I usually keep it simple. Sure, I love jewelry as much as the next girl, but I’ve put many a bauble back in its case after spotting a not-so-brilliant price tag and asking myself some hard questions, like, will neon bubbles/geometric blooms/crystal spikes still be in style next season? Does my dog really need food this month? Thankfully, there’s a new crop of online shops that offer of-the-moment accessories at wallet-friendly prices. One of them, Outrage Fashion, is based right here in the Bay Area. 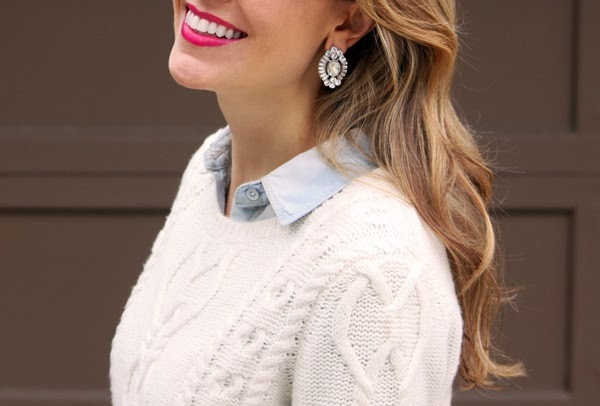 Their site is filled with plenty of holiday-ready gems, like these earrings, which add just the right amount of seasonal sparkle to a chunky sweater or that New Year’s Eve dress (and cost less than a few cocktails). Better yet, the folks at Outrage Fashion are offering one reader a $30 gift card. Read on for your chance to win. 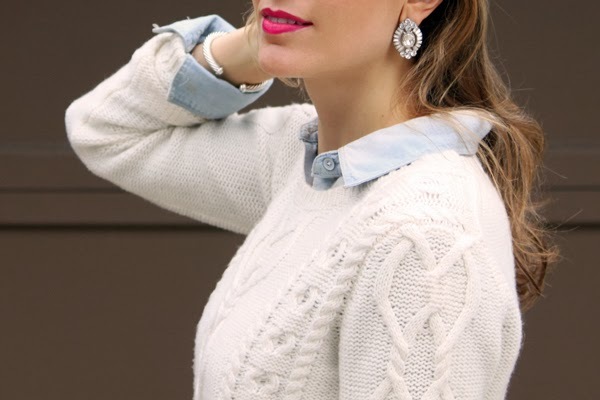 Gap sweater. 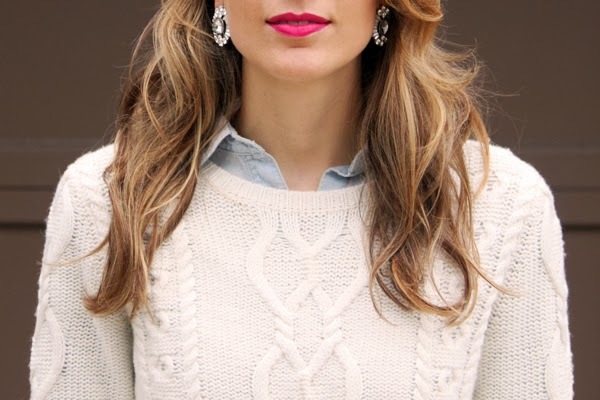 Madewell chambray shirt. Rag and Bone jeans. Frye boots. Earrings c/o Outrage Fashion. Valentino sunglasses. David Yurman bracelets and ring. Michele watch. Burberry bag. Lips: YSL #7 Le Fuchsia. To enter, log into Rafflecopter below and tell me what sparkly thing over at Outrage Fashion caught your eye. You can earn extra entries by liking Once Upon a Blog on Facebook, following me on Twitter, and tweeting about the giveaway. Entries must be received by midnight on Monday, December 2, 2013. Good luck! Julia, you look simply stunning and I am digging the photography! Great choice in accessories. I am glad Dapne still gets to eat this month. Lovely giveaway! Visiting from Friday Fancies link up! You look SO gorgeous and I love your outfit and pink lipstick! I'm obsessed with those sparklers. And I also rarely spend money on jewelry! I usually choose clothes and other more necessary things over baubles.